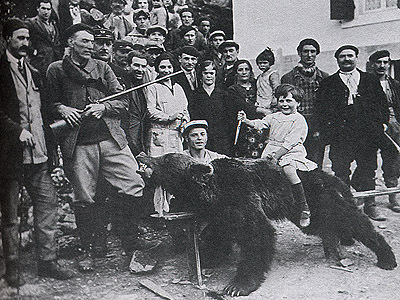 I came across this rather harrowing photo in a book review of Historie de l’ours dans les Pyrénées in El Pireneo Digital. It was taken in 1928 after a hunt in Urdós, Valle de Aspe across the border in France. In 1935, some 200 bears still survived in the Pyrenees and Pre-Pyrenees. The last bear steak was offered in restaurant in French Pyrenees in 1960. A ban on hunting came in Spain in 1967 and in France several years later. Today, with just 20 odd animals in the entire Pyrenees – most of which were brought from the Balkans, further reintroduction is the only way of re-creating a viable population of bears in the range.